I had a brilliant week in Melbourne as a guest of the State of Design Festival. Loads of interviews and events that all culminated with my keynote speech on the Saturday. There was, however, an event on the Saturday morning - July 26, 2010 - that was extremely interesting to be a part of. 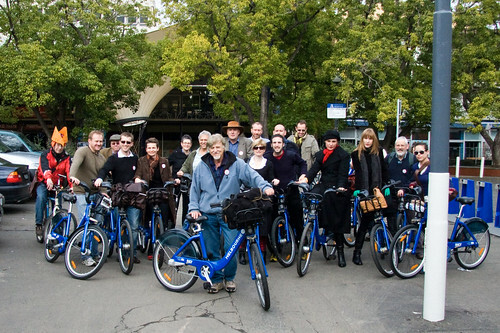 A group of citizens, rallied together by filmmaker and bicycle advocate Mike Rubbo, decided to go for a bicycle ride together on Melbourne's new bike share system bikes. A splendid idea. 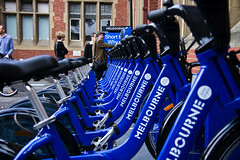 Melbourne's bike share system is shiny new, although unlike most cities in the world with a bike share programme, only 70-odd people are using them each day. In Dublin, by contrast, there are over 30,000 subscribers. Not to mention the cracking successes in Paris, Barcelona, Seville and most of the over 100 cities with such systems. 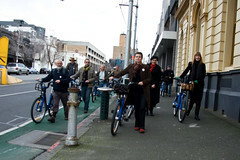 So, a group of people, many of them Copenhagenize.com readers, fancy a bike ride. Sounds lovely enough. They met up at the bike racks at Melbourne University. Hired the bikes without a problem. Now the tricky bit is that you can rent a bike spontaneously - the whole point of such systems - but you then have to figure out how to get a bike helmet. The State of Victoria, like all Australian states (not Northern Territory... they repealed their all-ages helmet law when they saw cycling levels fall drastically) has an all-ages mandatory bike helmet law. 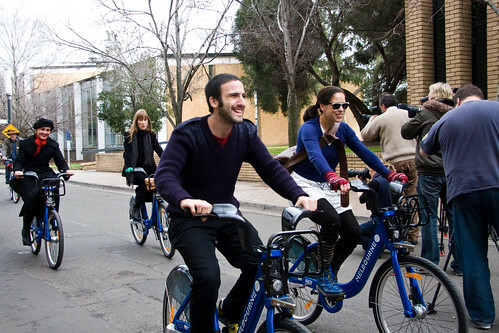 The bike ride was a demonstration to point out that a bike share system won't work with a helmet law and that Australia's failed helmet laws should be reconsidered. I arrived at about 09:40, together with my son, Felix. 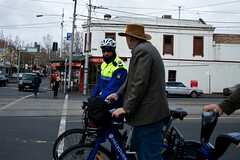 After greeting some of the people I noticed two Melbourne bicycle cops lingering nearby. Speaking in low tones, eying the 'mob'. They had been there since 09:00, waiting for this 'demonstration' to kick off. Seriously. Two city employees lingering, doing nothing, for an hour because some people had announced they were going for a bike ride. Mike Rubbo had generated some good pre-press about the ride. Like this from the ABC and this article in The Age newspaper. Should public-bike scheme users be excused from wearing helmets? Felix and I took a bunch of photos but this shot really sums it up for me. 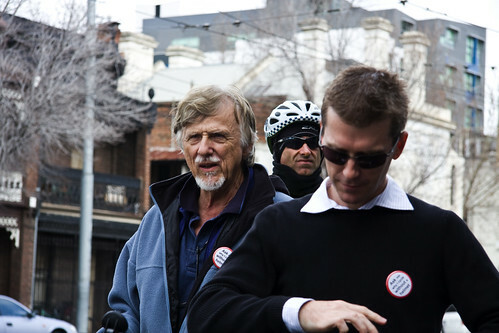 Mike Rubbo on the left, Dr Paul Martin on the right and an ominous-looking police officer keeping an eye on us all. Dr Martin is from Brisbane and flew down for the ride. He recently recieved a ticket for cycling without a helmet in Queensland and is intent on fighting it, following in the footsteps of Sue Abbott, from New South Wales. They were all wearing badges from The European Cyclists Federation's Ask Me Why I Cycle Without a Helmet campaign. 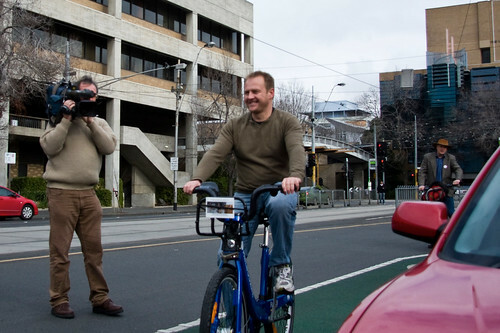 Mike Rubbo also did a film about the bike share system in the days up to the protest. 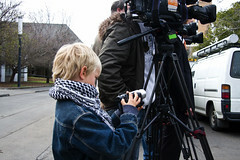 There were loads of cameras and journalists present during the whole event. People going for bike rides must be big news in Australia. 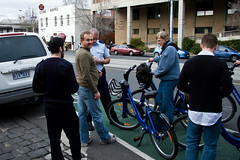 After Mike Rubbo did the talking to the press the group was off. All in all, it was a frightfully well-dressed demonstration and with the exception of the recent Velo-City Global conference in Copenhagen and conferences in La Rochelle and Lleida, Catalunya, I hadn't before been with such a large group of well-informed people who knew their science about helmets and who were so passionate about promoting cycling. 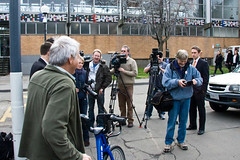 Here is one of the bike racks for the bike share bikes and here's Felix joining the press corps to document the event. It was great to have him along to witness this little slice of democracy. I explained the whole situation to him as neutral as possible. 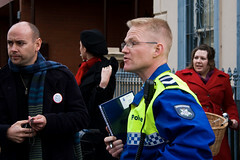 What from I understand the University of Melbourne grounds were private property so the police - and camera crews - tagged along as the group rode away. 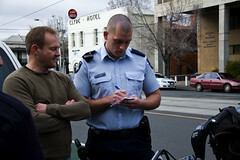 As soon as the group hit the mean streets of Melbourne, the police moved in. Three bicycle cops and three (!) 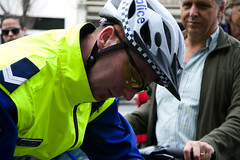 police cars were in action to tackle the 20+ well-dressed people on bicycles. Comical. After some discussion the police informed the group that they wouldn't be ticketed but if they decided to continue riding, they would be. Six or seven of the group set off. They were all ticketed accordingly. 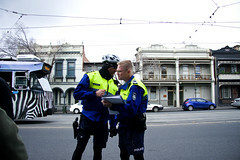 The fine for cycling without a helmet in Melbourne is a whopping $160. Not exactly encouraging people to cycle, now is it. Fining them for contributing to lower pollution levels, better public health, etc etc. is hardly the way to build the foundations of a bicycle culture. In contrast, Sydney is experiencing a greater boom in cycling, despite having less infrastructure, largely because they don't bother punishing cyclists for riding bicycles without helmets. After the evildoers were duly punished, we all walked our bikes for the rest of the short route. One chap was straddling his bicycle and was told to dismount. Straddling bicycles is, apparently, illegal. After the formalities were complete and the route was completed, the bikes were returned and we retired to a local café for a coffee. Pleased with the results, pleased that a debate, hopefully and finally, has been launched in this country. Hopeful that the work of so many Australians may finally reach a greater audience. Dr Dorothy Robinson, Prof. Piet de Jong, Chris Gilliam, Bill Curnow, et al. 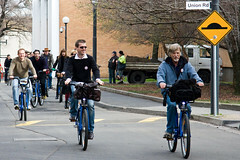 There's always room for a spot of Cycle Chic, even when protesting. 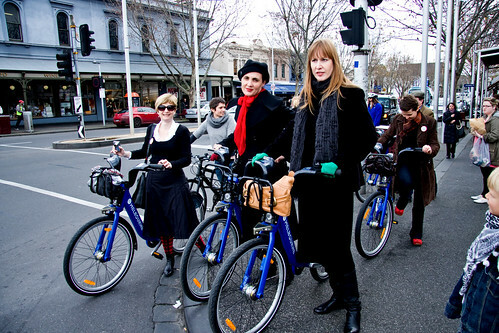 At left is Jenny from Auckland Cycle Chic and at right is Saskia from Cycle Chic Sundays - Sydney. Both made the trip to Melbourne to hear my talk. Which was wonderful! At the end of the day it's a David v Goliath challenge, but this was an excellent start. Now it's interesting to see what Vancouver does or doesn't do with their impending bike share system.